Here is a list of tools I use in my fermentation-lab (i.e. kitchen) absolutely everyday! Some of these tools I even travel with. Often we have them already hanging around the house. These tools, I have to say, definitely make my fermentation experience a bit easier, quicker and mostly cleaner ;). Plastic Sieve. Metal sieves allow for oxidation and thus rust when we are using them too often to filter our cultures. Whether you are filtering your vinegar, water kefir, milk kefir, kombucha or rejuvelak – the constant contact with metal will irritate your cultures as well as create rust on your sieve. I use a plastic sieve to avoid this and be kind to my SCOBYs. Here is the kind I use and have for years already! For other squishy filtering projects, like fruit vinegar, tepache, Kvass and even nut and seed sprouting, I love to use these nut-milk bags. And, just as mentioned, you can make great nut-milks! Multi-purpose tool that I even travel with as its easy and thin to pack and simple to throw in the wash. This is my favorite one below, founded by a friend of mine doing so many right things! Ethical fabric and make, even the packaging is from recycled material and recyclable. For the same reason of oxidation, I also use stainless steal OR plastic funnels. To be completely honest, I am not the most precise pourer :). I think funnels are an amazing tool to minimize messes. That is with sodas and syrups of course as well as with krauts and sauces with a wide-mouth funnel. Simply amazing to have at hand to keep my enthusiastic pours at minimum-spillage. If we are still on the topic of drinks and vinegars, I would highly suggest flip-top bottles. They are known to open before an explosion would occur, but to be honest, you can never be too certain. In the case of ginger-beer, I use food-safe plastic bottles so I can feel the pressure building on the bottle. Moving on to baking. Something I do everyday. I would be able to do it all without Cornelius, my 153 year old sourdough starter of course. Then a great and simple tool to make the results just that much more beautiful. A bread basket. I powder mine with rice flour so the dough doesn’t stick for the proofing (final rise) period. Then when I flip out the loaf before the bake, I get a beautiful swirl design on top. This is a tool i also travel with to bake as I go to get beautiful loaves wherever I am. If you want to get a bit more serious in your kitchen, here is a tool you can invest in. A Dutch Oven. Or a cast iron pot. This is a tool that creates the perfect environment in any oven to bake bread, even going camping. The iron allows for the same temperature to be created inside when the lid is on, which imitates a professional bread oven. CAUTION – these guys are heavy! Celebration – they make amazing eggs, stews, roasts and more. The lid acts as a pan and the pot as a pot, and together it’s an oven. 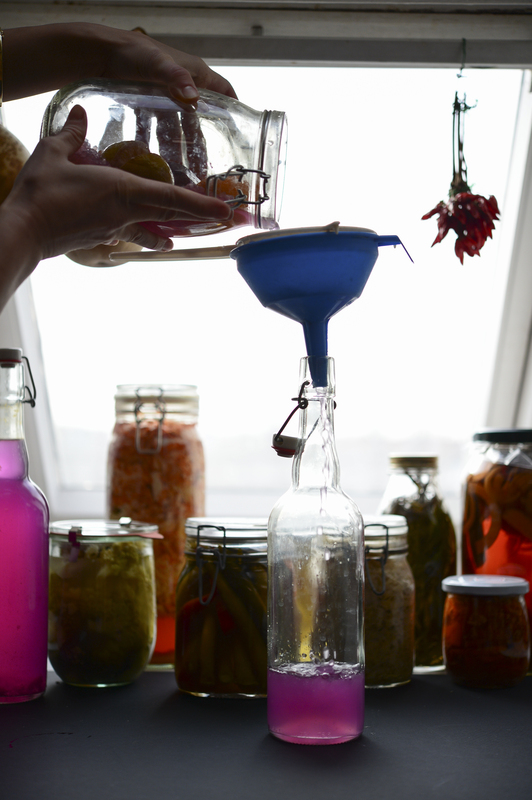 What fermentation tools can you not go a day without? - leave us a comment! Below is a video I created on one of the Microbial Circus Tours – what I actually take along with me while I am doing workshops on-the-road!